The St. Croix National Scenic Riverway includes the upper 200 miles of river extending from its headwater source near Gordon, WI and along the Minnesota/ Wisconsin border to Taylor's Falls, MN/St. Croix Falls, WI. It includes the Namekagon River in Wisconsin, the St. Croix's largest tributary. The riverway is one of eight original rivers designated by Congress when the National Wild & Scenic Rivers Program was established in 1968. The 200-mile riverway includes 181 miles of "scenic" classification and 19 miles of "recreational" classification under the federal program. (See general information on river classification). 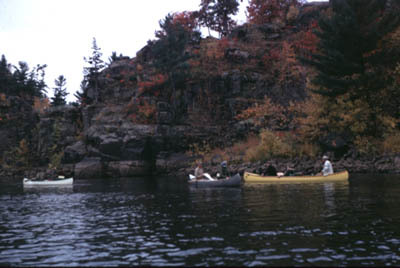 The Upper St. Croix River is managed by the National Park Service. See also Lower St. Croix National Scenic Riverway. Management direction for the Upper St. Croix River originally came from a 1976 "master plan", which in recent years had become outdated and in need of replacement. The National Park Service began development of a new management plan in 1994, and a draft plan was distributed for public review in late 1997. Following public comment, that plan was revised and a final plan was completed. It became available August 31, 1998. To obtain a copy, call the National Park Service at (715) 483-3284.